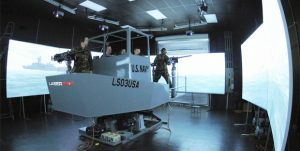 Laser Shot’s Boat Crew and Naval Gunnery Trainer consist of an immersive training environment that places sailors in geo-typical and geo-specific virtual environments in order to train effectively on a variety of crew level operational tasks and waterborne gunnery. 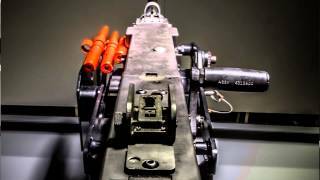 Integrated with the advanced training courseware of Virtual Battlespace 3’s Tactical Weapon Simulator (VBS3-TWS), combined with exclusive laser-based individual and crew-served training weapons, enable Laser Shot to deliver the most realistic and immersive conditions possible in a training environment. Recommended is a total of six (6) borderless projection screens to encompass the bow, port and starboard sides of the boat. This screen configuration provides an encapsulating, realistic environment and a 180° target engagement area. 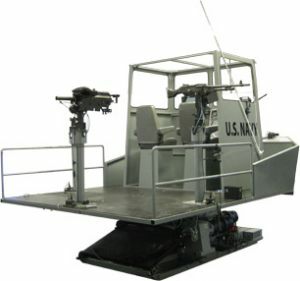 The vessel is replicated with a complete coxswain station including steering wheel and throttles as well as gun positions on the bow, port and starboard sides for crew served weapons. Projectors and laser-detection cameras are floor mounted, clear of the training area to provide easier access for maintenance and calibration. Computers will be centrally networked at the Instructor’s control station enabling expansion to multiple training Pods at that location or from any regional location. Optional on-board systems for radar ship-to-shore communications & complete crew communication system. © Copyright - Laser Shot, Inc. All rights reserved. All NSN numbers / GSA schedule pricing is limited to United States of America government and restricted (not applicable) for any international usage.